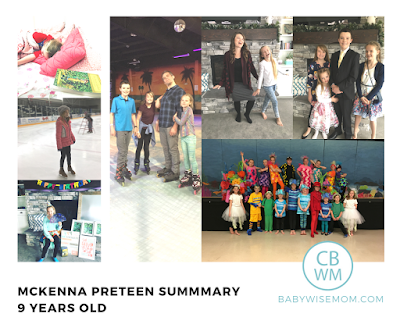 This is a preteen summary for McKenna from 8.75 to 9 years old. This includes information on a nine year old girl. Eating is great. Just to illustrate how non-picky of an eater McKenna is, I asked McKenna what she wanted for her birthday dinner. I will make the birthday boy or gal the meal of her choice. Huh? Soup? I mean, McKenna doesn’t complain about anything we eat, and she always eats her soup all gone, but she rarely asks for seconds when we have soup and she never oohs and ahhs over how much she loves the soup. “Are you sure you want soup? You could have anything.” I pressed her. I then listed off a long list of foods that are big hits at our house. That was not listed in my long list. She insisted upon it, though, so that is what we had. Sleep is great. I have to give her a time she needs to end reading at night. A “lights out” time limit. She loves to read and would probably read on late into the night if she had no restriction. To ensure she has motivation to actually check the time and turn lights out, we tell her if she consistently can’t turn lights out in time, she won’t get to read before bed at all. I am understanding of the occasional miss; I know I have gotten lost in a book and lost track of time! It happens. But it can’t be a habit or the norm. Last time I talked about what a golden age third grade is. Well, school is still great for McKenna, but I have been made aware of a fair amount of drama happening in her grade among some girls. It has gotten pretty bad. She hasn’t been a part of it, nor have her closest friends. I am glad they have all been able to stay out of it. I mention it just so others reading these updates are aware that drama definitely can happen at this age. I typically see it start mid-fourth grade and really hit in fifth, but sadly third graders aren’t immune. McKenna and a good friend of hers are now in charge of helping a kindergartener eat lunch and get to class. Our kindy is half day, but this boy is going all day, so he goes to lunch and then goes to the afternoon class. During this time, McKenna continued her musical theater class. She was cast as Sebastian in their production (performance in May). She was excited because Kaitlyn was Sebastian in our school musical. McKenna also had piano lessons. She practiced soccer once a week. Then she had the musical at the school. She was a Sea Creature in our school production of the Little Mermaid JR.
McKenna has been loving Wings of Fire, Goddess Girls, and Chronicles of Prydain. She also read a Wrinkle in Time and loved that. I wanted her to read it before she saw the movie.